and even occasionally, shockingly, trans fats in some bars! So with that said, some of the worst protein or "energy" bars out there have at least 1 or more of these problems above. In all honestly, it's actually really hard to find a good bar that doesn't have one of these problems. I've even seen some bars marketed as "healthy" that contain corn syrup as the 1st ingredient ! No, I'm not joking... they should be arrested for false advertising like that! 1. One of the first things I look for on the ingredient label is to make sure there is ZERO soy protein. Soy is also the most genetically modified of any crop (which has it's own potentially scary issues we won't even delve into in this article)... and even worse, soy proteins in particular typically concentrate much of the phytoestrogens in soy (different than xenoestrogens), which adds a double whammy for adding belly fat to your body. Organic soy is a step in the right direction, but I'd still stay away from it for many reasons. Instead of soy protein, I look for healthier protein sources in my bars, such as brown rice protein, hemp protein, whey protein, or even just obtaining the protein content from various nuts and seeds. 2. The 2nd most important thing that I make sure to avoid in protein bars are artificial sweeteners .... so I look out for sucralose, aspartame, acesulfame potassium (a.k.a acesulfame K), or any other artificial sweeteners. I also try to avoid large amounts of sugar alcohols . If a bar only has 1 or 2 grams of sugar alcohols, that's not a big deal, but I try to avoid anything more than that. 3. The 3rd thing I look at is total carbohydrates and total grams of fiber. Specifically, what I look for is a good ratio of grams of fiber to grams of total carbohydrates . The higher the ratio of fiber compared to total carbs, the better this bar will be for your blood sugar stabilization, and therefore, appetite control. For example, if bar1 has 5 grams of fiber, but 50 grams of total carbs, that's only 10% fiber content out of total carbs. Not good! However, if bar2 has 4 grams of fiber, and 16 grams of total carbs, that's actually 25% fiber content out of total carbs! Bar2 had 1 gram less fiber, but had a MUCH better ratio (2.5x better ratio) of fiber to total carbs. Bar2 is the clear winner... assuming it doesn't contain the other evil ingredients we talked about above. 4. The 4th most important thing I look at on the nutrition label of a protein bar or energy bar is the protein content vs the carbohydrate content . 5. Another thing I generally look for in a good bar is about 8-15 grams of healthy fats (usually obtained from nuts and seeds in the ingredients, coconut oil, or almond butter). This is important not only for having a good tasting bar, but also to make sure the bar has a better glycemic profile (which the healthy fats help with), and help to satisfy your appetite longer. 6. The last thing I look for in a good bar is simply a bonus if it does contain any... and that would be if it has any superfoods or greens... superfoods such as spirulina, maca, blue-green algae, kelp, chlorella, goji berry , raw cacao or organic cocoa powder, and other greens, etc. So with all of those things in mind, what are the BEST bars out there? Well, I previously used to recommend a couple that were my favorites - Larabars and Organic Food Bars . I still think both of these are excellent bars , and use almost solely organic, raw, natural ingredients without any soy protein, HFCS, artificial sweeteners, or other junk. However, I've always felt they could do slightly better on the fiber content and the protein content... as those are 2 of the most important aspects of a good bar that I look for. So, just last week, I found a NEW bar, that has just become my new favorite bar ! 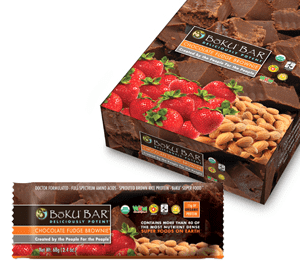 It's called the Boku Superfood Bar and I just received my box in the mail a couple days ago... and I'm blown away at not only how delicious these bars taste, but also how practically perfect they are in terms of nutrition! And they're even cheaper than most bars at my local health food store... and better quality. Needless to say, I'm a little excited about this new find! Overall, these are the best bars I've found in terms of taste and nutrition combined! You've gotta give em a try! Also, I love this company because of their focus on super high quality ingredients. I've also tried their Boku SuperProtein and and their Boku SuperFood , and I love the quality of both of those products too. I think they're one of the best companies out there these days in the health food space for sure. If you liked this article and thought it was helpful, please help your friends and family and copy the link to this page and share with your friends in Facebook, Twitter, etc.